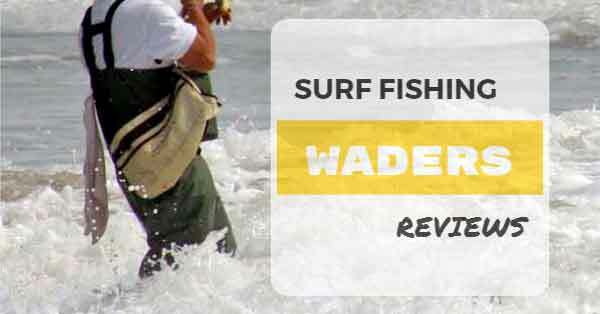 5 What are The Best Waders For Surf Fishing? There are few better ways to truly experience the great outdoors than surf fishing. But, having the wrong pair of waders can quickly leave you soaking wet -either from water leaking through them or because their material isn't breathable and traps sweat. The best waders for surf fishing will keep the water out while simultaneously wicking away sweat, leaving you comfortably dry. Top quality products also won't be bulky, allowing for free range of motion, but will be tough enough to withstand scrapes against rocks or plant growth along the water's edge. That's why our top pick for the best waders for surf fishing is the Toggs Amphib 3.5mm Neoprene Boot-Foot Wader. Whether you're fishing off the coast or are neck deep in willows in that backwoods trout stream, these waders have all the features you need, plus a few more you'll quickly come to love. The Toggs Amphib Neoprene Boot-Foot Waders have a snug fitting high-backed design that allows you to wear them in deeper water while still keeping water out. They do not come with a belt, and while the snug fit does help keep out the surf, for safety reasons it is strongly recommended to purchase a belt (Frogg Toggs has an Adjustable ﻿﻿Wading Belt available at a very affordable cost). But, what makes these our choice for the best surf fishing waders is the 3.5mm thick neoprene construction with reinforced knee pads. This material flexes and allows you to move comfortably so bending down to bait your hook or land your catch isn't an issue. These Bib-Style Waders feature neoprene suspenders with a hook and loop adjustment. They also have a fleece lined hand warmer pocket that makes them great for use in that early spring crappie season. Unlike many other options, the Toggs Amphib have attached boots that are lined with 200-gram Thinsulate insulation that will help keep your feet warm even with thin socks. The boots themselves feature "chain track" cleated outsoles to provide traction even in loose sand and gravel. See price and more of these Frogg Toggs Waders... Click here. The Reddington Crosswater by Sportsman Supply are booty-styled waders made of three layers of DWR coated polyester to provide excellent leak-proof protection while still letting you move freely. This multi-layer construction also makes these waders warm while still being thin and lightweight. That makes them a great dry choice for those late autumn fishing trips before the snow hits. Although these waders are thin, don't let them fool you! The multilayer construction makes them durable and able to withstand bumps and scrapes on rocks. The booties are made of high-density neoprene with an integrated neoprene gravel guard and hook. This allows them to fit well with any wading boot while keeping your feet dry and warm. These made our list of the best waders for surf fishing due to the shoulder strap system with opposing buckles and integrated belt loops that allow you to easily adjust the waist height for a perfect fit. There is also a flip-out chest pocket with drain holes and a YKK zipper. This allows a convenience place to store your keys or a pair of pliers. Plus, with those drain holes, you won't have to worry about placing wet items back into the pocket after use and getting your clothes all wet. These surf fishing waders are constructed of premium microfiber fabric with a waterproof yet breathable membrane. The knees and seat are reinforced with four layers of material, making them rugged and truly functional whether you're fishing in the sand or along the rocky shore. This reinforcement also ensures that these waders will last you for a number of seasons while still keeping you warm and dry. These waders come with adjustable suspenders and a safety belt, both of which feature quick release buckles that allow you to easily slip these waders on or off. These are booty style waders, with neoprene feet, hooks, and attached gravel guards that allows them to easily work with any wading boot. An inside accessory pocket lets you safely store valuable items (such as your keys or ID.) There is also a lined hand warmer pocket on the chest that makes these waders an excellent choice for cooler weather. The top also features a draw cord that helps to provide a customized fit. See price and more of these Adamsbuilt Waders... Click here. These waders for surf fishing are perfect for the job thanks to a durable polyester outer shell with CaddisDry technology that keeps the water out while letting perspiration through. This allows you to stay warm, dry, and comfortable regardless of the weather and how active the surf is. These are booty style waders with the feet constructed of neoprene and having been double taped, glued, and stitched to keep your feet comfortably dry. There are attached gravel guards and hooks that allow these waders to work well with any wading boot. The chest features a hand warmer pocket and a zipper pocket that make these waders convenient and truly functional. Adjustable suspenders and safety belt allow for a perfect, customizable fit. While these are not snug fitting waders, they are also not baggy, although they allow plenty of room to fit a pair of jeans underneath. These surf fishing waders come with a lifetime manufacturer's warranty. What are The Best Waders For Surf Fishing? When looking for the best waders for surf fishing, you want to find a pair that will fit comfortably, keep you dry, and keep you warm in cool weather. But they also need to be breathable so that, while the water is kept out, your clothing doesn't get soaked with sweat. Our favorite was easily the Frogg Togg's Amphib 3.5mm Neoprene Waders. These come with attached boots, so you don't have to worry about finding a separate pair that comfortably fit and accommodate the wader's booties. They are also tough, yet flexible, to allow you to move freely and to do everything you need to do without having first to adjust them so you can bend or kneel.